The 10 Best Hot Dog Joints in Washington State! From hot dog eating contests to the backyard barbeques, there is nothing more pleasing or more distinctly American than the fabled assemblage of frank and bun. The hot dog can be enjoyed simply with a small squirt of classic mustard or ketchup, or it can be a sapid adventure, escorting you to the new and unusual, but always satisfying. So light those grills and bring your best appetites because Washington State has got it all when it comes to this distinctly American taste! Diggity Dog is a great place to bring the family because there is a dog for everyone! With regionally-titled dogs, like the cream cheese and onion Seattle dog and the coleslaw and chili-topped Louisiana dog. Diggity Dog hits the spot every time! Dog in the park is a definite fan favorite. There's not much here for externalities, it’s a humble hot dog stand sitting right next to the Seattle space needle. But when it comes to how good these dogs are, you’ll be hard pressed to find a better place. This is where the Seattle Dog got its start. You know, cream cheese and grilled veggies! That’s the way of the northwest and we wouldn’t have it any other way! Locally owned and operated Des Moines Dog house is a classic hot dog diner that serves beautifully executed hot dogs, they serve all that’s expected from the northwest with great service and a smile. The dog house has some added flavors that you wouldn’t expect in a dog house as well. Make sure you try some empanadas to go with that chili or Seattle dog! With great hot dogs and local beers and wine, this is an Eastern Washington favorite! Its arguable that there is nothing more American than the hot dog, you have rather simple base of meat in a bun, but the possibilities of its toppings are endless, and in this process, it’s made unique. Wild Dawgs shows this unique quality in every item on their menu. Andrae’s Kitchen located in Walla Walla, Washington, has some of the best hot dogs in the state! Andrae comes from a French culinary background whose European tastes add an extra element to the dogs he dishes out. The bacon wrapped AK-47 dog is a fan favorite! Uli’s famous sausages are handcrafted and made by native German Uli Lengenberg. This place brings the mastery meats from the old word, but distinctively American in the way Uli explores the world of spices and hand crafts his sausages daily which make for some amazingly fresh and delicious dogs! Come in and enjoy! Featured in popular travel food shows like “Bizarre Foods with Andrew Zimmern,” this is one of Washington’s favorite hot dog eateries! Yes! The Seattle Dog with its mad combination of cream cheese and grilled onions makes this business distinctively delicious and distinctively Northwestern! 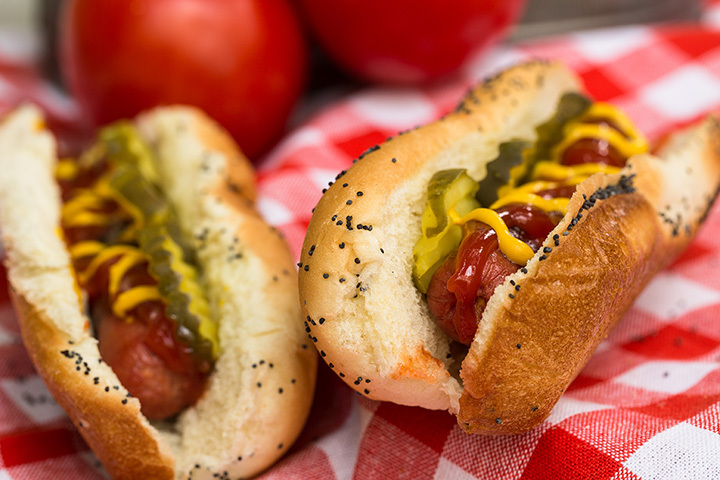 Grilled bun, fire-grilled Nathan’s hot dogs and a humble offering of beverages makes this a simple classic American Dog stand, however they do offer a litany of condiment options. The simple base paired with a variety of condiment options makes this a local favorite. Located in the iconic village modelled in the Bavarian style, it’s no wonder that this business creates some of the best dogs in the state. Enjoy the German beer and live music on the weekends. Voted Best Restaurant by the Washington State Wine Awards! Come on in to The Red Hot and enjoy any number of their delicious dogs. From the classic mustard, grilled onion and chili topped “Coney,” to the adventurous peanut butter and bacon topped “Hound Dog!” Wash it all down with any number of the craft brews they have on tap!